Return to President Obama's White House in this New York Times bestselling anthology for young women by young women, featuring stories from ten inspiring young staffers who joined his administration in their 20s with the hope of making a difference. Includes a foreword by actress (Grown-Ish) and activist Yara Shahidi! Shahidi is the creator of Eighteen x '18, a platform to empower first-time voters. And then they joined his White House. Smart, motivated, ambitious--and ready to change the world. Kalisha Dessources Figures planned one of the biggest summits held by the Obama White House--The United State of Women. Andrea Flores fought for the president's immigration bill on the Hill. Nita Contreras traveled the globe and owned up to a rookie mistake on Air Force One (in front of the leader of the free world!). Here are ten inspiring, never-before-told stories from diverse young women who got. Stuff. Done. They recall--fondly and with humor and a dose of humility--what it was like to literally help run the world. 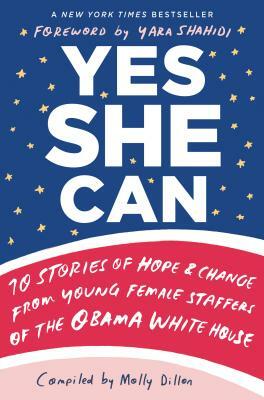 YES SHE CAN is an intimate look at Obama's presidency through the eyes of some of the most successful, and completely relatable, young women who were there. Full of wisdom they wish they could impart to their younger selves and a message about the need for more girls in government, these recollections are about stepping out into the spotlight and up to the challenge--something every girl can do. Molly Dillon served in the White House from 2013 - 2017 in the Domestic Policy Council's Office of Urban Affairs, Justice and Opportunity. Originally from Highland Park, Illinois, she currently resides in New York, NY. With contributions from Jenna Brayton, Eleanor Celeste, Nita Contreras, Kalisha Dessources, Molly Dillon, Andrea R. Flores, Vivian P. Graubard, Noemie C. Levy, Taylor Lustig, and Jaimie Woo. "Yes She Can shows the importance of creating spaces for women and girls to showcase their brilliance and excellence. It is exactly the book girls need to read right now to show them that everyday girls can and will change the world."